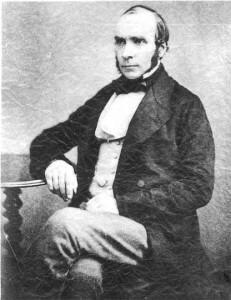 John Snow was an emin­ent phys­i­cian who is con­sidered the father of modern epi­demi­ology and one of the founder mem­bers of the Epidemiological Society of London. He was born on the 15th March 1813 to William and Frances Snow in North Street, York. William Snow was a labourer work­ing in a coal yard adja­cent to the River Ouse, which was the main form of trans­port for heavy goods until the advent of the rail­way. North Street was one of the poorest streets in York, being adja­cent to the river, with poor drain­age and the con­stant risk of flood­ing. The Snow family were very reli­gious and John was bap­tized into the Anglican church of All Saints, North Street. He was sent to a private school at the age of six but how his family man­aged to afford it remains a mys­tery. When he was 14 (1827) he was appren­ticed to William Hardcastle, a sur­geon in Newcastle upon Tyne. This prob­ably had a great bear­ing on his future life because at that time, sur­geons per­formed oper­a­tions without the use of anaes­thet­ics. In 1831 there was a chol­era out­break in Newcastle, which was his first exper­i­ence of the dis­ease. After he had com­pleted his appren­tice­ship in 1833 he worked as a surgeon’s assist­ant, first in Burnopfield in County Durham, and then in Pately Bridge, North Yorkshire. He then moved to London and qual­i­fied as a phys­i­cian in 1843 and early in his career he became inter­ested in the physiology of res­pir­a­tion. His interests lead him to be invited to wit­ness one of the first applic­a­tions of ether as an anes­thetic. He imme­di­ately real­ized the import­ance of tem­per­at­ure during the admin­is­tra­tion of the anes­thetic, and within one month he pub­lished tables of the vapor pres­sure of ether. He also designed sev­eral instru­ments and masks to con­trol the admin­is­tra­tion ether. During this period he also exper­i­mented with many other chem­ic­als as a means of anes­thesia and this lead to him becom­ing the most prom­in­ent author­ity on the sub­ject in the UK. In 1853 he admin­istered chlo­ro­form to Queen Victoria at the birth of Prince Leopold and from then on anes­thet­ics became more accept­able. Cholera epi­dem­ics occurred in London in 1848 and 1853 and it was gen­er­ally believed that chol­era was caused by miasma or breath­ing in fowl air, but John Snow’s first exper­i­ence with chol­era and his stud­ies of res­pir­a­tion made him ques­tion it. It was during the second out­break that an epi­demic occurred near his home in Soho, when more than 550 people died, that Snow plot­ted the deaths on a map and inter­viewed the res­id­ents of the dis­trict. He con­cluded that it was spread by drink­ing con­tam­in­ated water, in this case from a pump in Broad Street, and on the 8th of September 1854 the coun­cil removed the handle on the pump. For most of his life, he was a veget­arian and did not drink alco­hol, although when he became ill in his late thirties he was advised that a glass of red wine a day would be bene­fi­cial to him. Snow died in 1858 at the age of 45 from a severe stroke.